Many people are not a fan of tofu. I get it; I really do. The texture can be off-putting, and some are unsure of the plant-based isoflavones found in tofu. Is it healthy or not? Much confusion surrounds this often misunderstood food source. When in doubt, I often seek out population studies. Soy-based products are a common denominator in areas associated with longevity. For that reason, coupled with its versatility and cost-effectiveness, it’s something we enjoy a few times per month. We do prefer organic, however. Getting back to the funny texture…we have found that “pressing” tofu prior to preparation makes a huge difference. For this recipe, I sliced the block of tofu lengthwise in thirds. I then placed the slices on (clean, lint-free) dish towels followed with towels on top, followed by my very heavy cast iron pan (who needs to lift weights?). I let the tofu sit for about an hour as I busied myself with lesson plans. Even as little as 15 minutes of pressing, however, will yield an impressive result. Another key component to this recipe is the use of arrowroot starch.This helped yield a satisfying crispy texture. I much prefer the results using arrowroot starch vs cornstarch. It mixes better and doesn’t have that off-putting residue that I find with cornstarch. Arrowroot starch can be readily found at your favourite health food store. Several students commented that the tofu reminded them (in a good way) of sesame chicken. Speaking of sesame, I used unrefined sesame oil. This recipe would be terrific with a toasted sesame oil as well. We enjoyed this over a bowl of sweet potato mash, with a side of sauteed onion, kale and corn, and topped it with avocado slices and crushed pistachios – yum! If you give this a try, we hope you enjoy it! 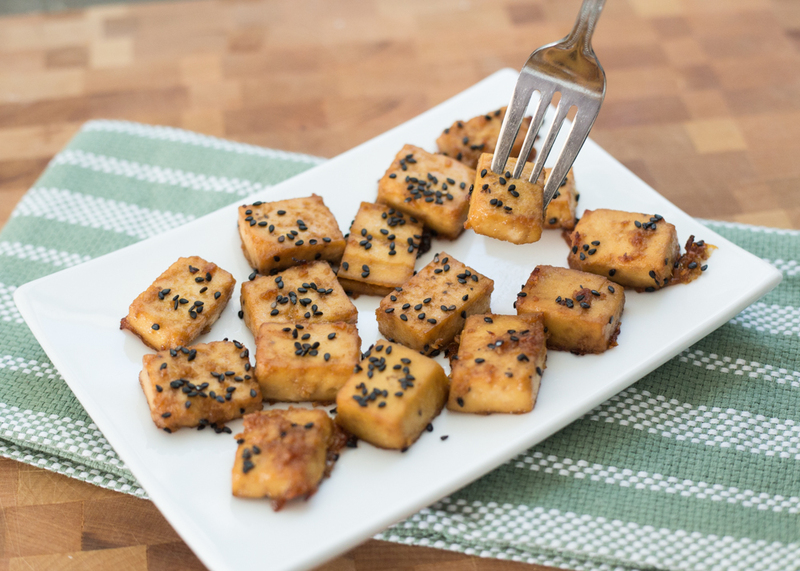 Cut pressed tofu into bite-sized pieces. Mix together tamari, oil, maple syrup, ginger and garlic. Add tofu to mixture. Sprinkle starch evenly over tofu. Place tofu on parchment-lined baking sheet. Sprinkle with sesame seeds. Bake at 400 degrees for 25 – 30 minutes. Enjoy!